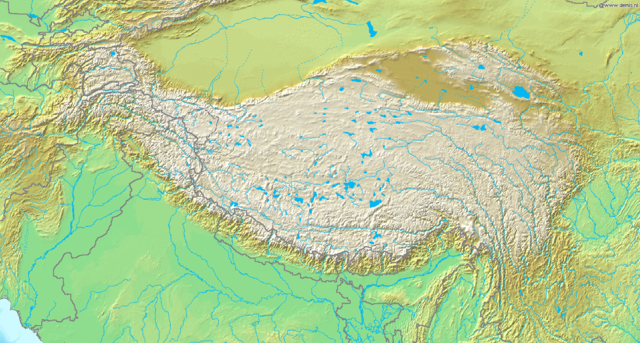 The Tibetan Plateau in south-central Asia, because of its size, elevation and impact on climate, is one of the world’s greatest geological oddities. At approximately 960,000 square miles it covers slightly more land area than Alaska, Texas and California combined, and its elevation is on the same scale as Mount Rainier in the Cascade Range of Washington state. Because it rises to such a height into the atmosphere, it aids in bringing monsoons over India and other nations to the south while the plateau itself remains generally arid. For decades, geologists have debated when and how the plateau reached such staggering heights, some 14,000 feet above sea level, approximately half the elevation of the highest Himalayan peaks located just south of the plateau. But novel research led by a University of Washington scientist seems to confirm an earlier improbable finding‒ at least one large area in southwest Tibet, the plateau’s Zhada Basin, actually lost 3,000 to 5,000 feet of elevation sometime in the Pilocene epoch. “This basin is really high right now but we think it was a kilometre or more higher just 3 million to 4 million years ago,” said Katharine Huntington, a UW associate professor of Earth and space sciences and lead author of a paper describing the research. The co-authors of the paper are Joel Saylor from the University of Houston and Jay Quade and Adam Hudson, both from the University of Arizona. The paper was published online in August and will feature in a future print edition of the Geological Society of America Bulletin. The Zhada Basin is home to rugged terrain, with exposed deposits of ancient lake and river sediments that make fossil shells of gastropods such as snails easily accessible, and determining their age is relatively straightforward. The researchers studied shells dating from millions of years ago and from a variety of aquatic environments. They also collected modern shell and water samples from a variety of environments for comparison. The work confirms results from a previous study including Saylor and Quade that examined the ratio of heavy isotope oxygen-18 to light isotope oxygen-16 in ancient snail shells from the Zhada Basin. They discovered the rations were very low, suggesting the basin had a lighter elevation in the past. Oxygen-18 levels decrease in precipitation at higher elevations in comparison with oxygen-16, therefore shells formed in lakes and rivers that collect precipitation at higher elevations should have a lower heavy-to-light oxygen ratio. However, those lower ratios are dependent on a number of other factors, these include: temperature, evaporation and precipitation source, which made it difficult to say with certainty whether the low ratios discovered in the ancient snail shells meant a loss of elevation in the Zhada Basin. So the scientists also employed a technique called clumped isotope thermometry, which Huntington has used and worked to refine for several years, to determine the temperature of shell growth and get an independent estimate of elevation change in the basin. Bonding, or “clumping” together, of heavy carbon-13 and oxygen-18 isotopes in the carbonate of snail shells occurs more readily at colder temperatures, and is measured by a tool called a mass spectrometer that provides data on the temperature of the lake or river water in which the snails lived. The scientists found distinctly greater “clumping”, as well as lower ratios of oxygen-18 to oxygen-16 in the ancient shells, showing that the shells formed at temperatures as much as 11 degrees Celsius (20 F) colder than average temperatures today, the equivalent of as much as 5,000 feet of elevation loss. The reason as to why the elevation decline occurred is open to question. One possibility is that as faults in the region spread, the Zhada Basin lowered, Huntington said. It remains unknown whether other parts of the southern plateau also lowered at the same time, but if the elevation loss was widespread it could be because of broader fault spreading. It is also possible the crust thickened and forced large rock formations even deeper into the earth, where they heated until they reached the consistency at which they could ooze out from beneath the crust, like toothpaste squeezed from the tube. She noted that climate records from deep-sea fossils show Earth was considerably warmer when the cold Zhada Basin snail shells were formed. Funding was provided in part by the National Science Foundation, the American Chemical Society Petroleum Research Fund, the Comer Foundation and the Natural Science Foundation of China.